In today’s diverse society, it’s very common for people to have various dietary restrictions. This can make it difficult when you want to choose a place to go out to eat. 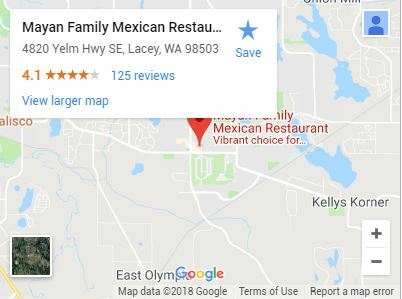 At the Mayan Mexican Family Restaurant in Tumwater, we accommodate all sorts of people. Keep reading to find out the best menu items for various diet plans. Which diet plans might restrict your choices? There are many reasons why you might refrain from eating certain items. Below is a list of some of the most common, plus suggested dishes to enjoy. Kosher: If you’re an observant Jew who keeps kosher, you don’t eat pork or shellfish, and you don’t mix dairy and meat in the same dish. While our kitchen is not certified by a rabbi, we do offer dishes that are acceptable for the guidelines above. Suggested Plates: You can ask for any of the burritos or tacos to come without cheese. 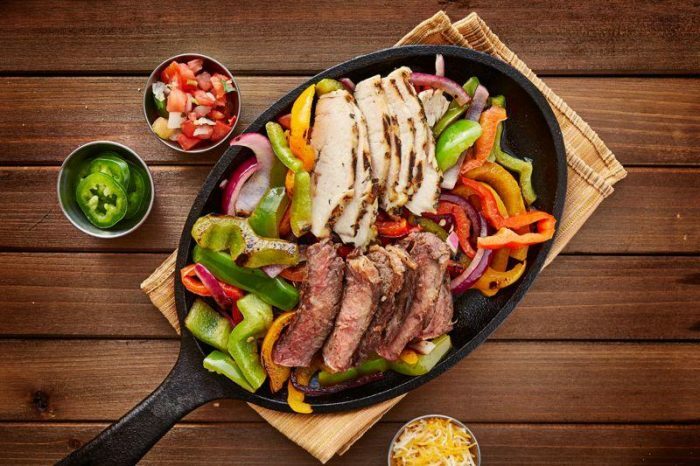 Fajita dishes have meat but no dairy. Avoid any dish on the menu that lists chorizo, pastor or camarones, as those are pork and shrimp dishes. Note that refried beans have cheese on top, so if you order a meat dinner you should ask for it without cheese. Halal: Halal is the dietary code of Islam. Our kitchens are not certified as halal, but we offer dishes that are free of haram or forbidden ingredients. Suggested Dishes: As with kosher, avoid any pork, crab or shrimp dishes. None of our other meats come from haram animals. We don’t serve blood in our meat. Jehovah’s Witnesses: Jehovah’s Witnesses don’t consume any dishes with blood. As stated in the Halal section, none of our dishes contain blood. Hindus: Hindus don’t eat meat. Suggested Dishes: For vegetarian options, choose a salad. We also offer rice and beans for protein. If, like many Hindus, you will eat poultry, order any of our dishes with shredded chicken. Celiac and Gluten-Free Celiac sufferers cannot eat gluten. Many other people also eschew gluten for other reasons. Suggested Dishes Wheat, the source of gluten, is not a common grain in Mexican dishes. Just make sure to avoid burritos, as they all use flour tortillas. Stick with tacos instead. Make sure to also ask that with any dish you get served to please replace any flour tortillas with corn tortillas. Diabetes Diabetics have to watch their sugar and starch intake. Too much can cause them to go into diabetic shock. Suggested Dishes: Fajitas are an excellent choice because the tortillas come separate from the other ingredients. Simply avoid the tortillas and enjoy the peppers and lean meat. Don’t order nachos, tacos or burritos, as the tortillas in these dishes are all starchy. Our deserts, such as flan, are not good for diabetic diets. If you want a taco salad, just make sure to leave the bowl. Cardiac Issues: People with high cholesterol and other conditions that affect the heart have to be very careful when it comes to what they eat. Suggested Dishes: Avoid burritos or anything that comes with a flour tortilla, or substitute corn tortillas instead. Leave those tortilla chips in the bowl. Instead of chorizo or carne asada, go for a lean meat, such as shredded or grilled chicken. Salads are a good option for low fat and low cholesterol, so long as you use no dressing or a vinaigrette. As for no sour cream on your plate. IBS and Other Stomach Issues: Some conditions cause violent reactions to spicy foods. 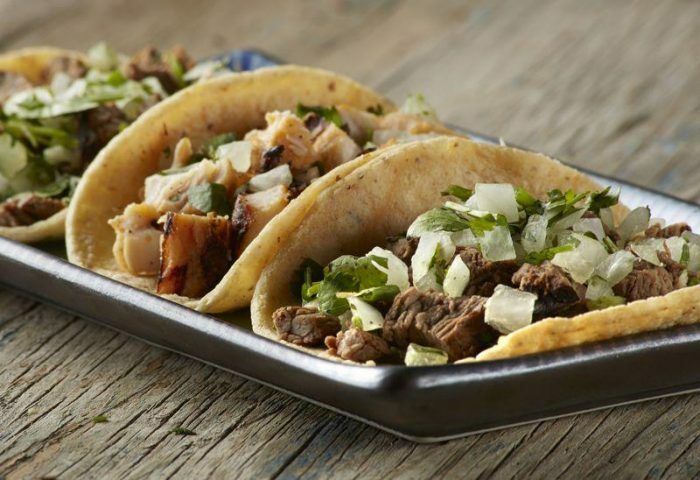 Mexican food is one of the hotter cuisines, but you do have options. Suggested Dishes: If you have a dish with sauces, chose mole, as it’s usually less spicy than red or green salsas. Shrimp cocktail is a good option, as are fish tacos, which usually only have shrimp and onions, plus herbs. Vegetarians and Vegans: Vegetarians don’t eat meat, and vegans eat nothing that comes from an animal. Suggested Dishes: If you’re vegan, rice and beans or salads without cheese are your best bet. Vegetarians can ask for the same, plus meat-free nachos and other dishes. Vegetarians can also enjoy a sweet flan for dessert. Pescatarian: The only meat that a pescatarian eats is seafood. Suggested Dishes: Enjoy any of the vegan or vegetarian options. You might also enjoy a delicious prawn cocktail, fish tacos, or a shrimp burrito. When you plan to go out to eat with your family, it doesn’t have to be a hassle for anyone in the group. 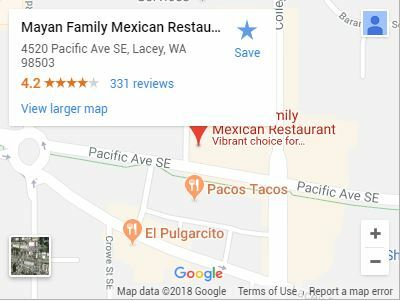 Choose Mayan Family Mexican Restaurant. We’ve got locations around the Olympia, Tumwater, and Lacey region, so there’s one near you. We understand that many people have needs that don’t quite conform to the average person, and we’re happy to make substitutions or answer your questions. We want every guest to enjoy their meal as much as we do. Our restaurants have been in business in the community for many years, and we have deep roots here. Our chefs are experts at traditional, authentic Mexican foods but we can also prepare some American dishes to suit every taste. Come on in whenever the urge strikes, or you can reserve our banquet rooms to serve a large party. This can give you and your guests some privacy, especially if your dietary restrictions are sensitive. You can view our menu online. Come on down or call ahead if you want to get your large party seated. We’ve got a bar in every location, which is perfect for partying with friends or a date with your partner. Our ingredients are fresh, our recipes are traditional and hearty, and we keep the chips and salsa coming. Enjoy a fine Mexican cerveza or any number of domestic beers, or treat yourself to a wonderful tequila. There’s no need to wonder about where to have dinner tonight, whether you’re alone, with a partner or the whole family. 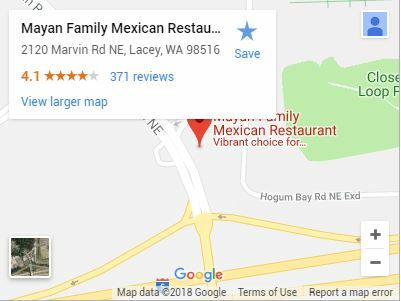 Make it Mayan Family Mexican Restaurant and go home happy.